"Parents Who Host, Lose the Most." Furthermore, most, if not all, of the towns in Stevenson's school district have local ordinances that tighten up any loopholes in the state law and provide harsher penalties. In Buffalo Grove, Lincolnshire and Vernon Hills, even if the parents (or owners of the house) are not aware that underage drinking is occurring in their house, they can still be charged with violating the social host law. Most of these ordinances state that if the parents are simply home, the police can assume the parents permitted the drinking to take place. The burden of proof falls on the owners of the house to prove that they took all necessary steps to prevent underage drinking to occur, including controlling access to the house and the alcohol in the house. 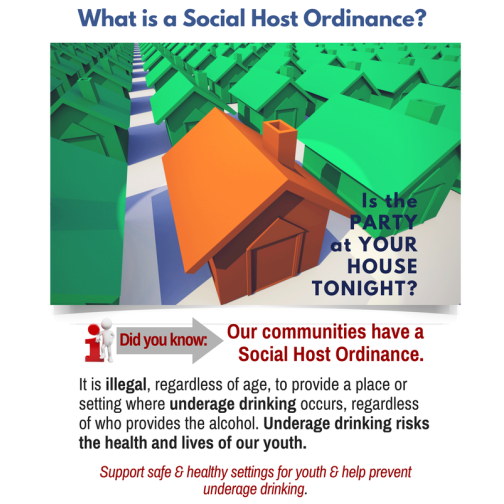 The Buffalo Grove ordinance goes further and even states that the homeowners do not even have to be home to be guilty of social hosting. These local ordinances also expand the scope of the state law. Police officers can charge not only homeowners with social host violations, but anyone in "control" of the home can be charged, including the minor child. Furthermore, these ordinances can be applied to not only residences, but any property controlled by an individual, including a hotel/motel room, limo, bus or boat. In addition to the local ordinances being tougher in terms of the burden of proof and scope, the fines are also stronger. For instance, the first fine for social hosting in Buffalo Grove is $1,000 and increases to $2,000 for each subsequent violation. Most importantly, with any of these laws, if any injury or damage results to or from the underage drinker, the "host" of the party can not only be charged with a Class 4 felony (jail time) but the injured party can initiate a civil law suit and can include in their law suit reasonable attorney fees. The bottom line is, it's very risky to host a party where persons under the age of 21 may attend. In the event you do decide to hold a party, please understand the risks both at state and local levels. If you find yourself in a situation where underage drinking is occurring, no charges will be filed if you request assistance from law enforcement after you discover the illegal activity. It is your responsibility to contact the police before they contact you and avoid violating state and local social host laws. Municode - The nation's leading legal publisher. Village of Buffalo Grove - Code of Ordinance: 5.20.192 - Social host responsibility. the possession or consumption of the alcohol by the person under 21 is not otherwise permitted by the Act." Violators will be guilty of a Class A misdemeanor and will be subject to $500.00-$2,500 in fines. Such a parent also faces the risk of being sued in civil court. * premises: includes but is not limited to not only residences, but any property controlled by an individual, including a hotel/motel room, limo, bus, boat, etc.